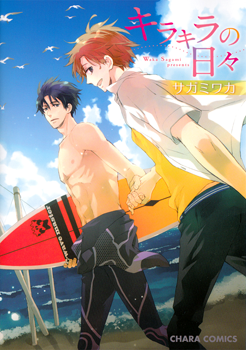 The first part of Kirakira is about Nanami who secretly admires the surfer Shuu. The latter is usually expressionless and difficult to approach. For some reason, he laughs and talks a lot when he’s around Nanami. The second story included is Kamatte Kawaii Hito. Natsumi Hayato goes to a cat cafe to cure his fear of cats. He meets the Hikaru who is known for being the Prince of the cafe. Thus, their seemingly dog-cat relationship starts. The way their romance unfolds is a little fast but it’s nice seeing their reactions to one another. Both characters are stubborn and won’t budge right away.